Stands for Loheat Dairy Water Heaters We advise the use of these strong galvanised stands to both increase the effectiveness of your water heater and prolong its life. Safely elevating the heater to the required / optimum level, the stand also distributes the weight of the heater over the entire base, preventing any warping or bowing that can occur when heaters are supported on bricks or pillars. 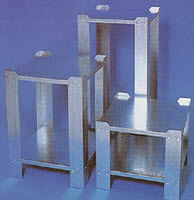 All stands are supplied in flat pack kit form for easy self assembly, which only takes minutes. milkingmachines.co.uk © Copyright 1999 - 2018. Web design and SEO by Shaun Wheeler. This site was last updated 02/10/2018, and features in isleofwightweather.co.uk. loheat.co.uk sell dairy equipment and water heaters. milk-bar and calf-feeding.co.uk sell calf feeders. Part of the dc engineering specialist dairy engineers and milking machine installers collection of milking machine and dairy equipment websites, helping provide you with usable milking solutions.